WASHINGTON -- The U.S. Justice Department filed a civil lawsuit against Volkswagen Group on Monday for installing illegal devices meant to defeat emissions testing -- an opening salvo in a legal battle that could be far more costly for the automaker than had been expected. The lawsuit alleges VW violated the Clean Air Act by installing illegal devices to impair emission control systems in nearly 600,000 vehicles in the U.S. Volkswagen could face fines in theory exceeding $90 billion - or as much as $37,500 per vehicle per violation of the law, based on the complaint. While the court is unlikely to come anywhere near that amount, according to a senior Justice Department official, the penalties sought against the company would still be in the billions of dollars, another senior Justice Department official said. Analysts believe any fine will be far below the theoretical maximum. Although U.S. authorities sued Toyota for up to $58 billion for environmental violations around the turn of the century, they agreed a settlement that cost the Japanese carmaker about $34 million. In September, government regulators initially said VW could face fines in excess of $18 billion. The Justice Department lawsuit, filed on behalf of the Environmental Protection Agency (EPA), accuses Volkswagen of four counts of violating the Clean Air Act, including tampering with the emissions control system and failing to report violations. The lawsuit is being filed in the Eastern District of Michigan and then transferred to Northern California, where class-action lawsuits against Volkswagen are pending. "We're alleging that they knew what they were doing, they intentionally violated the law and that the consequences were significant to health," a senior Justice Department official said. The Justice Department has also been investigating criminal fraud allegations against Volkswagen for misleading U.S. consumers and regulators. Criminal charges would require a higher burden of proof than the civil lawsuit. The civil lawsuit reflects the expanding number of allegations against Volkswagen since the company first admitted in September to installing cheat devices in several of its 2.0-liter diesel vehicle models. The U.S. lawsuit also alleges that Volkswagen gamed emissions controls in many of its 3.0-liter diesel models, including the Audi Q7, and the Porsche Cayenne. Volkswagen's earlier admissions eliminate almost any possibility that the automaker could defend itself in court, said Daniel Riesel of Sive, Paget & Riesel, who defends companies accused of environmental crimes. To win the civil case, the government does not need to prove the degree of intentional deception at Volkswagen - just that the cheating occurred, Riesel said. "I don't think there is any defense in a civil suit," he said. Instead, the automaker will seek to negotiate a lower penalty by arguing that the maximum would be "crippling to the company and lead to massive layoffs," Riesel said. Even after Volkswagen first admitted to using defeat devices in certain models, the automaker "failed to come forward and reveal" that other vehicles contained such devices, the government said. To cheat the emissions controls, Volkswagen installed software that allowed the vehicles to detect when they were being tested on a flatbed. When the vehicles detected they were actually on the road, the software caused the emissions control systems to underperform or shutdown, the government said, allowing the cars to emit dangerous levels of air pollution. The civil lawsuit does not preclude the Justice Department from pursuing criminal charges against Volkswagen, said the Justice Department official. 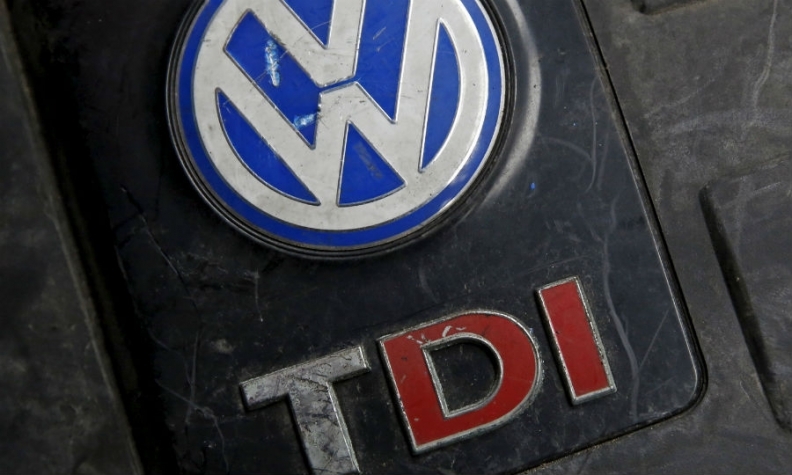 Volkswagen is working with all government agencies investigating its diesel engines for possible violations of the Clean Air Act, company spokeswoman Jeannine Ginivan said in an emailed statement. It is also developing an independently administered program to compensate consumers for their economic losses, she said. "Volkswagen will continue to work cooperatively with the EPA on developing remedies to bring" the affected vehicles into full compliance with regulations as soon as possible, Ginivan said. The company has suspended sales of its diesel vehicles in the U.S. until the matter is resolved. Volkswagen had been making some progress on the European side in addressing the pollution scandal. The company won regulatory approval in Germany last month for low-cost fixes for 8.5 million diesel engines in Europe equipped with the cheating software, out of 11 million in total worldwide. The EPA said that talks with the company about repairing the affected vehicles hadn't been resolved. "So far, recall discussions with the company have not produced an acceptable way forward," Cynthia Giles, assistant administrator for enforcement and compliance assurance at EPA, said in a statement. The Justice Department is seeking an order requiring Volkswagen to take "appropriate steps," including mitigating nitrogen oxide emissions. Such steps might include forcing Volkswagen to install equipment to reduce pollution or buy back vehicles from owners in the U.S. To obtain such an order, the government would have to spell out what it's seeking in a separate filing later.